Mr. Jamitis shows us that the political right cannot get away with lowering its moral standards to accommodate the favored party’s nominee, then expect to retain the moral high ground when later condemning the left for having even lower morals. The right is inclined to justify its condemnation of the left on the grounds that the left is “more” immoral than the party and politicians of the right. However, that’s “comparative righteousness,” calling oneself right on the basis of not being “as” wrong, and comparative righteousness is itself hypocritical. I was actually prompted to consider this plaguing problem of right-wing hypocrisy just the day before I discovered Mr. Jamitis’ article. I was listening to an interview with a well-known Christian author, pastor, and founder of a church association in Russia. He referred to the disrespectful manner in which the American press speaks to the White House and President Trump, saying, “It is a shame – it shows such disregard for authority.” I agree. To speak disrespectfully of our President shows disregard for authority and is indeed shameful. It is a lapse in Christian character to fail to render honor to whom honor is due (Romans 13:7). However, for the last eight years, conservative talk radio, social media, and the emails that filled my inbox, were aflutter with ridicule, mocking, disrespectful and demeaning treatment of then President Obama. Sadly, I don't recall a single Christian leader or conservative commentator speaking out against such disrespectful conduct back then. In fact, many of the conservative politicos who now decry the disrespectful treatment of President Trump were not that long ago treating President Obama with similar contempt. It would seem that treating elected leaders with disrespect is only a sin if the leader has an "R" after his name. I guess it’s a question of whose ox is being gored. However, when Republicans gain control, the programs remain, the spending continues, and big government is treated as a permanent fixture. To this, the right responds with some disgruntled grumblings, sometimes putting on a rally to “hold them accountable,” then goes back to work to reelect those same Republicans in the name of “beating the Democrats!” Sometimes the right doesn’t even complain, but instead busily offers excuses as to why the favored party cannot implement the conservative agenda right now. For the past eight years, conservatives vehemently condemned Obama for his record deficit spending, yet fell silent regarding Bush having previously held the record for racking up debt. The right condemns Democrats for having instituted the plethora of unconstitutional and extra-constitutional federal bureaus, agencies, and programs, but they fail to decry with equal fervor the Republican-controlled House of Representatives that has kept every one of those programs fully funded. When it comes to recalling misdeeds and handing out blame, the right seems to have a selective memory, and is grading on a curve, instead of measuring conduct against an objective standard. When professing Christians who have God’s word to guide them and His Spirit to enlighten them, and conservatives who profess a knowledge of the constitutional form of government and of the principles of liberty, willingly deviate from the Biblical and constitutional standard, they bear greater responsibility for their actions than the unsaved or unenlightened. Their performance may be comparatively better than that of liberals, but they have professed knowledge of a higher standard and are now accountable for what they have admitted to knowing. When the left does what is unBiblical, unconstitutional, humanistic, socialistic, etc., they are merely being true to their unsaved, or unenlightened nature. However, when the political right, which admits to knowing a right standard and advocates for it, compromises that standard or deviates from it, for them it is hypocrisy, as they are now practicing something other than what they preach. Not all the guilt for right-wing hypocrisy lies at the feet of the knowing perpetrators of overt hypocrisy. We become unwitting accomplices in hypocrisy whenever we give aid, comfort, or political cover to those who are deceptively exploiting the well-intentioned, but misinformed. Like the pirates of old, flying a false flag to deceive their intended victims into allowing the pirate ship to draw close enough to board, then loot the other ship, the Republican Party, and many (not all) of its candidates, have been flying a false flag of conservatism to gain the trust of the political right which the party seeks to use as a base of support in its quest for power. Despite the good intentions of most dues-paying members of the party, and even many local level office holders, make no mistake, the Republican machine is not conservative. It’s only credo is power. This may be hard for some to hear, but if you doubt the assertion, please listen to this conversation between two former Republicans who have witnessed what goes on in the back rooms of state legislatures and at the highest levels of Republican Party marketing and strategy. When we support an entity that is engaging in deceptive and hypocritical conduct, we become its enablers and accomplices in its crimes. By merely associating with such a party, we provide political cover for it, inadvertently lending our personal Christian and conservative credibility to an undeserving recipient which then uses that credibility to deceive others into thinking the party is actually conservative. As we have seen, hypocrisy is not the exclusive domain of the left. Hypocrisy exists wherever people advocate a right standard, then willingly compromise that standard to accommodate the favored party or candidate. Hypocrisy happens whenever we lend our support to that which does not practice what we ourselves preach. And why should anyone listen to what we preach if we’re not practicing it? On these grounds, the political right has lost credibility, and has forfeited its right to be respected. The answer is not to hate Democrats for being liberal, nor to hate Republicans for deceiving and selling out conservatives, nor to hate me for telling you the truth. The answer is to stop the hypocrisy, stop the compromise, stop what George Washington called “the baneful effects of the spirit of party,” and return to a fixed and uncompromising standard. Then, it is our duty to stand, not wavering, not deviating, and not departing from the standard to chase after politicians, parties, or power brokers who offer us a seat at the table, but to stand, requiring that those who seek our support come join us under the just and true standard without hypocrisy. Woe to us if we do not so stand. I really don’t see God blessing hypocrisy. When I speak of an objective standard, or traditional conservative values, some may question just what such a standard looks like. Frankly, conservatism has morphed considerably over the past couple of decades. We would do well to rehearse conservatism’s original precepts. This abridged platform brochure articulates the policies of true conservatism that were being actively advocated by the political right when I was becoming politically active in the 1990s. How many conservative leaders have you heard addressing these issues lately, or how many Republican office holders are actively contending for these same policies today? If this platform sounds out of step, it’s because conservatism has gotten out of step with its roots. “I’m not a journalist by trade nor a politico by preference. I’m a blue-collar kind-a-guy whose more at home working with my hands; who’d rather be out doors; who on any given day would rather be hiking up a mountain or riding my motorcycle down a lonely two lane road somewhere just beyond the middle of nowhere. Bob is a Christian; through his study of this nation's history and its leaders has become Constitutionist and political activist. He serves as the chairman of the Constitution Party of Washington and is a member of the Constitution Party National Committee. 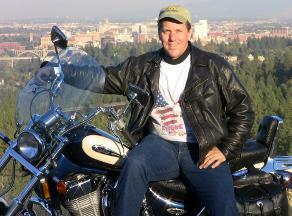 Bob lives in Spokane Valley, Washington where he is a landlord-handyman.